Over the next four years, local civic leaders say a cluster of vacant or underused properties in downtown Bennington will be transformed into a thriving urban hub -- with new stores, restaurants, offices and apartments created in a series of new or renovated multi-story buildings. The effort to redevelop the Putnam Block, which began taking shape more than two years ago, encompasses nearly the entire southwestern quadrant of the “four corners,” the intersection of U.S. Route 7 and state Route 9 in the center of downtown Bennington. The $54 million project involves renovation of the sprawling old Putnam Hotel building on the corner as well as two other 19th century structures just to the west and south. It also provides for construction of two new multi-story buildings – and perhaps a third building or a cluster of townhouses -- farther to the west along Main Street and Washington Avenue. The redevelopment effort is being carried out by an unusual coalition of local nonprofit organizations and businesses that set out to take advantage of the opportunity to buy nearly all of the properties on the block at once. The coalition includes Bennington College, Southern Vermont College and the parent company of the local hospital, Southwestern Vermont Medical Center. The four corners area of downtown historically was the center of Bennington’s business district. Local industrialist Henry W. Putnam built a three-story hotel on the intersection’s southwest corner in 1873, in front of the old Mount Anthony House hotel. Immediately to the south of the Putnam Hotel stood the county courthouse, built in 1870. The building most recently housed the offices and printing press of the Tri-State Pennysaver News, a weekly publication that shut down at the end of 2014. To the west of the Putnam Hotel stands the Winslow building, which dates from the same era. Beyond that, the Knights of Columbus, a Catholic fraternal group, built a hall adjoining the Winslow building in 1948. That was followed in 1949 by H. Greenberg & Son’s hardware store and lumberyard, and finally by a gas station on the corner of Main and Washington. Over the years, the Greenberg family acquired title to all six properties, totaling four acres, said Bill Colvin, assistant director of the Bennington County Regional Commission, which is managing the redevelopment project. The Greenberg family sold its hardware and building supply business in 2013, and the new owner closed the business the next year, leaving its buildings and land vacant. By 2016, “the property was in transition,” Colvin said. At the same time, other businesses in downtown Bennington were in decline. Some closed, and people were moving away from the town’s center. With the exception of the gas station and the Knights of Columbus hall, which was repurposed in 2012 as Oldcastle Theatre Company’s new home, the buildings of the Putnam Block were in poor condition and vacant but for a handful of ground-floor tenants. Two and a half years ago, a group of local civic leaders – including Dee and representatives of the two colleges, the Bank of Bennington, and other concerned individuals and business owners -- began meeting to see what they could do. Colvin credits the unusual alliance of the local hospital and the colleges for helping to lay the groundwork for an ambitious redevelopment plan. “It’s a testament to the leadership of the nonprofits that they recognized the direct link between local economic vitality and the long-term future of their institutions,” Colvin said. They realized, he explained, that a lively downtown would not only draw area residents to its businesses but also attract staff, faculty and students to the hospital and colleges. The Greenberg properties offered an obvious place to start. The result of these early talks was the formation of Bennington Redevelopment Group, a limited liability company that represents a joint venture of the hospital, the two colleges, the Bank of Bennington, Global-Z International, D.B. McKenna & Co., Anthony and Jacqueline Marro, and a group of individuals in their own limited liability company. 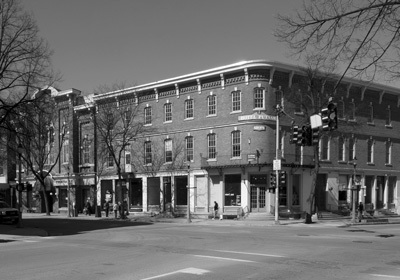 The goal of Bennington Redevelopment Group is to pursue revitalization of the Putnam Block – both by renovating historic structures and by adding new buildings to vacant or underused land in the former Greenberg complex. The town had commissioned a marketing study for housing, retail and office space demand for the whole downtown. The Bennington Redevelopment Group asked the study’s consultant to take a closer look at the Putnam Block. One of the top downtown needs identified by the town’s study was housing. Although many downtown storefronts are occupied, most spaces on the upper floors of downtown buildings – spaces that once provided office space or living quarters – are now empty. Alex Dery Snider, a spokeswoman for Bennington College, said creating more living space in the center of downtown would offer a variety of benefits. The hospital was feeling a housing pinch too. “We have a number of visiting staff,” Dee said, explaining that medical specialists in the hospital’s two- and three-year residency programs generally would rather rent than buy a house for that short period. The consultant’s study also found a need for downtown office space and certain retail businesses. Bennington College, for example, was already renting space downtown for offices that had to relocate while one of its campus buildings is undergoing renovation. The college projects that it will continue to need additional space off-campus even after the renovations are complete. Southern Vermont College was looking for a new home for its nursing and radiology program, and the hospital wanted to move some of its services downtown. Although downtown has a number of restaurants, cafes, and small food shops, the nearest full-service supermarket can’t be reached easily without a car. Colvin’s organization commissioned its own study suggesting the downtown area could support a grocery store of 8,000 to 10,000 square feet. “The redevelopment group realized it wasn’t going to get 70 to 80 new families downtown without access to groceries,” Colvin said. The influx of new residents also will provide business to support a small hardware store, a restaurant, and a cafe or coffee shop, the redevelopment group says. “When you put in a great grocery store and a home goods hardware store, it creates vitality and helps the other stores,” Dee said. The Bennington Redevelopment Group announced in July that it had reached an agreement with the Greenbergs to buy the six properties. A 4,500-page environmental assessment found no significant hazards that weren’t already known. The group had hoped to close on the property earlier this year but was delayed by an ongoing lawsuit between the Greenbergs and the owner of an adjacent property. Colvin said a settlement has been reached and is awaiting court approval, probably this month. Colvin wouldn’t confirm the purchase price, which has been reported at $2 million. Under the deal, the Bennington County Industrial Corp., a nonprofit group that promotes economic development in the area, will take title to the properties. As a nonprofit, the industrial corporation is eligible for grants that aren’t available to the Bennington Redevelopment Group, Colvin said. The industrial corporation will subdivide the property and transfer the three historic buildings to the Bennington Redevelopment Group when construction is ready to begin, probably in October. Oldcastle Theatre Co., which has already done extensive work on its building, is expected to buy it in October, Colvin said. The development group had offered the theater company several options, “and they decided they’d like to own outright,” he said. The first phase of construction will consist of renovating the three buildings that form the southwestern corner of Main and South streets – the old courthouse, the Putnam Hotel, and the Winslow building -- into offices, a 75-seat restaurant, storefronts and apartments. Much of the space in the three buildings is already leased, Colvin said. Bennington College has reserved most of the Winslow building for faculty offices and housing. 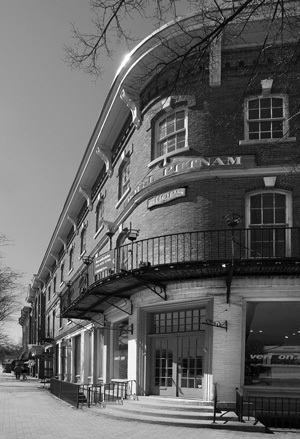 Bennington College and the hospital will take apartments in the Putnam Hotel for visiting faculty and staff. The redevelopment group is looking for a hardware store for the first floor of the Winslow building, which originally was a hardware store, and a restaurant and cafe for the first floor of the Putnam building. The estimated cost for Phase I is $24 million, with occupancy expected in early 2019. The industrial corporation will return the second group of properties to the Bennington Redevelopment Group before Phase II work is put out to bid in 2019. The lumberyard buildings and gas station will be demolished and replaced with new structures -- a grocery store and medical building, both with apartments upstairs. The 29 apartments above the grocery store building, to be called Beecher Square, will be offered on a “membership housing” model in which prospective tenants buy into the project, Colvin said. The hospital plans to transfer some services, yet to be determined, from its campus to the new medical building. Southern Vermont College’s nursing and radiology program would move in on the building’s second floor, and apartments on the top two floors would be available to graduate students and other residents. Phase II is estimated to cost $28 million and be ready for occupancy in late 2020. The scope of work beyond the first two phases remains to be finalized. A study commissioned by the town Select Board, released in January, found that a downtown hotel with 50 to 70 guest rooms could succeed if the rest of the project is completed. New buildings erected as part of the project will be handicapped accessible and have sustainable design features, including energy efficient construction, Colvin said. Some of the smaller apartments will be available at a reduced rent to people who meet income guidelines. The overall project is expected to involve 200,000 square feet of building space and add 340 new full-time jobs to the area by 2021. The Bennington Redevelopment Group plans to finance the project through a mix of federal tax credits, federal and state funding, investment by members of the redevelopment group and other members of the community, as well as private loans, donations, and buy-ins to the Beecher Square apartments. The federal financing includes tax credits intended to promote development in economically distressed areas. In addition, because the properties are in a national historic district, the project qualifies for tax credits for historic rehabilitation. The town also has applied for a $1.25 million federal Community Development Block Grant through the Vermont Community Development Program. Because of the past uses of some buildings at the site, including gas stations and a former printing shop, the area qualifies as a brownfield and could receive cleanup funding through the state Department of Environmental Conservation. The town wants to apply for state approval to create a Tax Increment Financing District that would allow collection of an additional tax on the area for parking and street improvements. However, the state has reached its limit on such districts, and it’s not clear whether that cap can be lifted. The project’s success will depend on whether enough organizations, businesses and new residents are willing to commit to investing, renting or leasing there to cover its costs. Rehabilitating the block will cost more than the finished buildings will be worth, so the direct return will be very small. “Everyone realizes it won’t make money in their lifetimes,” Colvin said. But profit isn’t the main goal. “We’re interested in reversing the trend in downtown,” explained James Brown, the president and chief executive of the Bank of Bennington. Dee said the project meshes with the hospital’s mission of improving the area’s overall health. “A lot of studies tie the health of people to the health of the environment they live in,” he said. Although some older residents are expected to be attracted to comfortable, low-maintenance apartments in a walkable downtown, the new apartments also could appeal to young people – many of whom now leave the area after finishing their work at the local colleges. Dery Snider said many new Bennington College graduates who want to stay in the area are thwarted by a lack of housing. For more information about the downtown Bennington revitalization project, visit putnamblock.com. © 2017 Observer Publishing Inc.